Best Laid Plans and all that . . .
It’s Easter Weekend and everyone has their plans made – where they’ll have Sunday dinner, what they’ll do with the kids over the Bank Holiday. Well, not everyone. Not quite. We don’t plan. We can’t plan. Well that’s a lie, because I have planned to spend the next two days at my Mums with Mr. M and the two boys, but right up until the minute we leave the house, I can’t say for certain whether or not that will actually happen. Everything in our lives is liable to change at very short notice and even the best laid plans get cancelled with minutes to spare. Little H doesn’t do things by halves you see. And he likes to add the element of surprise into the equation too. 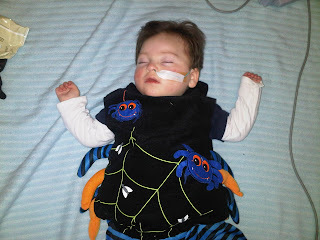 Last October,for example this cute little spooky spider was all dressed and ready for a Halloween party. 20 minutes before we left the house he had the first of a series of seizures. 30 seconds of not breathing. One minute and a half of not breathing. Two minutes of not breathing. Each one got progressively worse. Each time he reached a deeper shade of blue. Rescue medication given, hooked up to oxygen and a Sats monitor and he spent the next hour sedated while the effects wore off. Mr. M and Cheeky went to the party on their own. Little H crashed out and I nursed a cup of tea in front of the telly. Glad the seizures had stopped, disappointed that once more our plans were ruined. And if he is up to his old tricks – or likely to be (demonstrated sometimes, not always, by being a cranky little bugger or getting a temperature) – then the family is divided and one stays at home with Little H and the other heads out with Cheeky. The last few weeks have been remarkably ‘normal’ in our house; a healthy Little H has enabled us to make, and stick to, plans. The four of us have had dinner with friends, Cheeky and I managed to visit relatives in Ireland (we’re not at a stage yet that we’d risk taking H more than 20 minutes away from a hospital) and for the first time in a very very long time all four of us went to a Christening together. Wow! That’s some exciting life we lead! Little H has been a little bit cranky this morning. Cheeky has a cough. These are not good signs. If Cheeky has a cough, then it’s likely H will be getting it. If H gets a cough he likes to milk it for all its worth and starts requiring nebulisers every two hours, chest physio, suction and oxygen while he’s asleep. And he likes to throw in a few seizures just to keep us on our toes. So, whilst I will begin to pack the horrendous amount of stuff needed to take Little H to Granny’s for two days (I’ll save that list of items for another #definenormal post) there is every possibility that in two hours time I’ll be making my apologies, Mum will be sticking the lamb back in the freezer and H will be hooked up to oxygen/on his way to hospital. Who knows? Best laid plans? Pah! Who needs them? Live spontaneously. Live in the moment. That’s how we roll! You had me nodding and "uhuh"ing all through that post. We live life the same way. I like to think it's because we're too rock and roll to be predictable! Thanks Sally, glad I made you smile. Yep, extremely rock and roll Renata! :D yuk-melting hospital chocolate! Hate it! I have to say all that medical stuff would scare the bejesus clean outta me! I am 'lucky' that my daughter's seizures are a hell of a lot milder than your little sweethearts. Can't imagine what you all go through everytime there is a seizure. Much respect. In the life of a special needs family plans are those things you dream about and aspire to keep. Being a special needs family means being adaptable, as much as it pisses us off! Thanks Sarah - it's right, you just have to go with the flow a bit. My smallest has epilepsy but we are lucky that her meds control it but I know how you feel with the terrifying onslaught of a seizure.